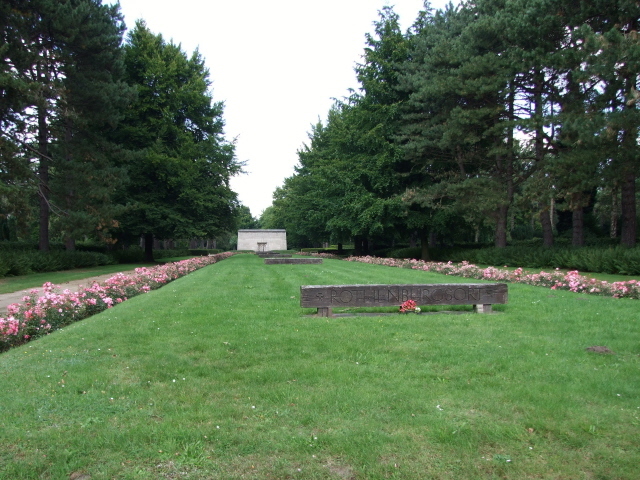 A huge cemetery in Hamburg, Germany – in fact the world's largest "park cemetery", and the second largest cemetery in the whole world, both by area, after Calverton National Cemetery in the USA, and by the number of people buried there, namely after the Zentralfriedhof in Vienna. It is indeed BIG – well over two miles / 3.5 km from one end to the other, and the total area is nearly a thousand acres. It even has two dedicated bus lines serving it – and you can even drive your own car on its over ten miles / 16 km of roads. It's this size alone that earns this cemetery its place on the dark tourism map, even though the style of the place is mostly rather garden-like and thus hardly of a grim character in its overall appearance. What there is to see: Primarily, of course, the hundreds and thousands of graves amidst a very green park, which is dominated by tall trees. Few individual graves are particularly remarkable, but a couple of special sites and monuments are worth pointing out. 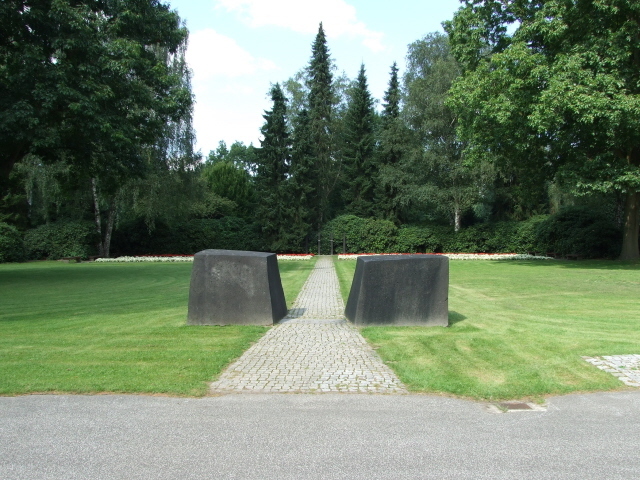 The monument and the mass graves of nearly 37,000 victims of the allied bombing raids and subsequent firestorms of 1943 (see also Nikolaikirche and Bunkermuseum Hamm). Wooden beams on each of the four sections (arranged as a cross) bear the names of those districts of Hamburg that the corpses of the victims were brought here from. The central monument is a rather strange one alluding to Greek mythology, hidden inside a stark square of granite walls – you have to peek through the iron gate. Individual graves around the monument and mass graves share the same dates of death and are marked "durch Fliegerangriff" = 'by air raid'. 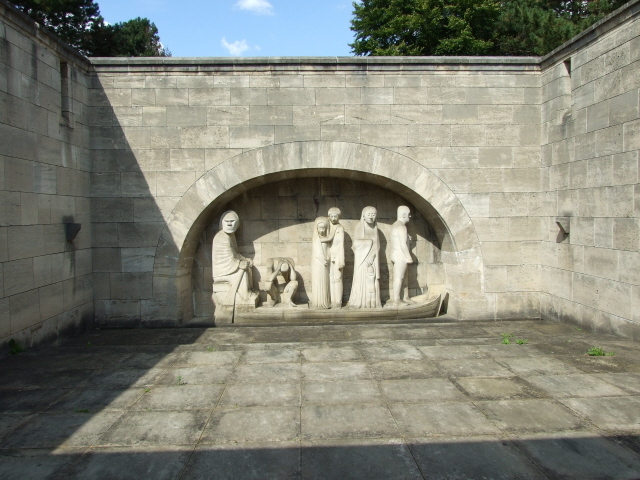 The complex is found in the eastern part of the cemetery, almost two miles / 3 km from the main Ohlsdorf entrance (remember those buses). 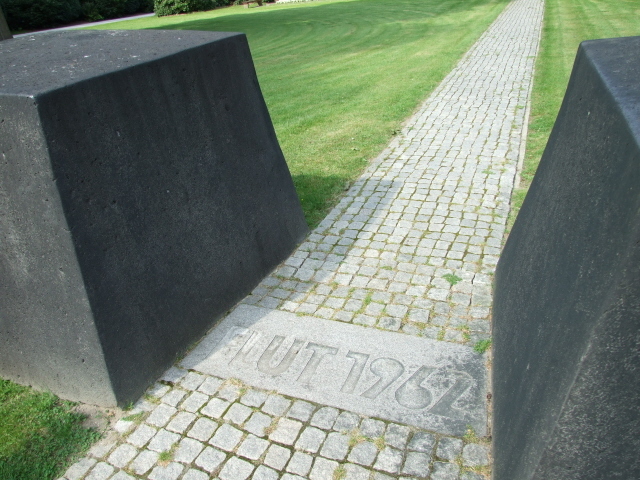 A bit to the north-west of the air raid memorial complex is a simpler and plainer monument to the victims of the floods that in 1962 killed hundreds of Hamburg's inhabitants. There are also war graves for foreign soldier, (including a British Commonwealth War Graves section south-west of the flood memorial on the other side of the central avenue, and about the same distance from it. Also graves Soviet POWs who died in captivity (or were murdered by the Nazis in medical experiments!) during WWII. 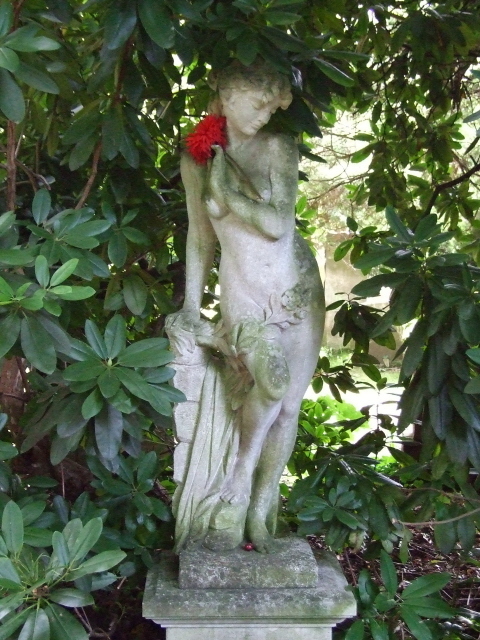 These are to be found near the side entrance on the northern central section of the cemetery. If you want to explore more, or find further individual monuments or graves, you need to arm yourselves with a map. This can be obtained at the small cemetery museum – which is probably another draw for the dark tourist in itself. But note the rather restricted opening times! Its collection includes various urns, historical photographs, documents such as instruction manuals for crematoria, and even a death mask (of an unknown woman, made in 1950). Labels are in German only, though, so a little knowledge of the language is required to get the most out of this small museum – presumably also in dealing with the enthusiastic staff. They can even provide you with copies of a special map marking the best examples of angel statues on graves! So it's worth timing a visit to Ohlsdorf with the museum's opening times and going there first, before setting out to explore the cemetery itself. Location: in the north of Hamburg, some five miles / 8 km from the centre. Access and costs: easy and free (museum has restricted opening times). Details: to get there from the centre of Hamburg, it's best to take the metro (U-Bahn) or regional metro trains (S-Bahn) to Ohlsdorf station (lines U1 or S1/S11). Looking north, take the right-hand side exit cross the road and walk the short distance south to the main entrance. Within the cemetery, two dedicated bus lines help in covering larger distances ... but check departure times in advance, they only run every 20 to 30 minutes. Line 170 does the northern loop, line 270 does the southern loop – both lines meet at the main entrance as well as along a short stretch of the central avenue in the eastern half of the cemetery, combined these lines serve 22 stops. Otherwise it's walking, walking and more walking. The cemetery's museum is (thankfully) located very near the main entrance, just south of the much more monumental Administration Building (and NOT in it). 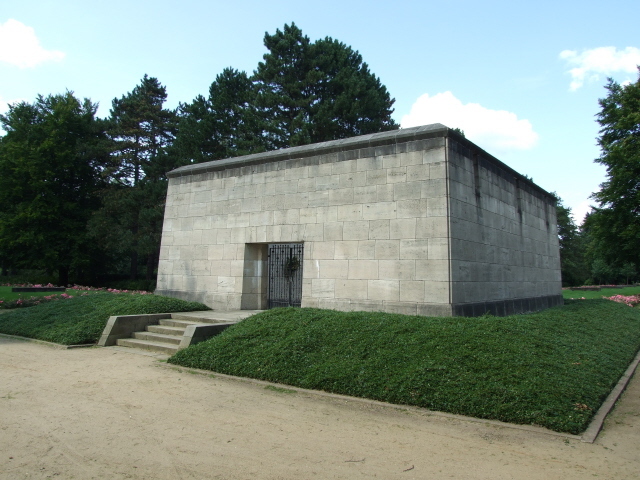 It's housed in a small single-storey white building at the beginning of Bergstraße opposite the Administration Office, within the perimeter of the cemetery's walls. The cemetery is open daily from 8 a.m. to 6 p.m. in winter and to 9 p.m. in summer. Admission is, obviously, free. 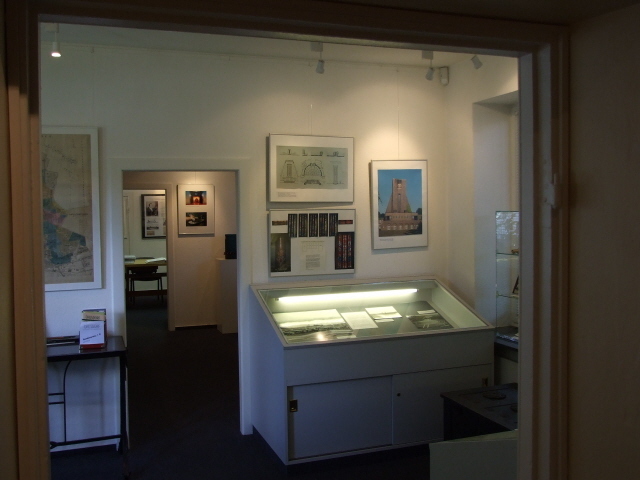 The little museum is also free, but has quite restricted opening times: only Mondays, Thursdays and Sundays from 10 a.m. to 2 p.m.
Time required: anything between a couple of hours and half a day. Theoretically you could spend more than a whole day here, so huge is the area, but I don't suppose that even the hardiest dark tourist could handle that much cemetery – and frankly, there's no point, as there isn't really that much to the majority of graves. The small museum requires only a few minutes, unless you can read German, in which case 20-30 minutes could easily be spent here … more if the museum staff are feeling particularly talkative (and you are able and willing to engage in the conversation). Combinations with non-dark destinations: in general see Hamburg – the cemetery as such is, being such a green oasis in the city, also a perfectly non-dark sight, and great for extensive strolls amongst the trees. 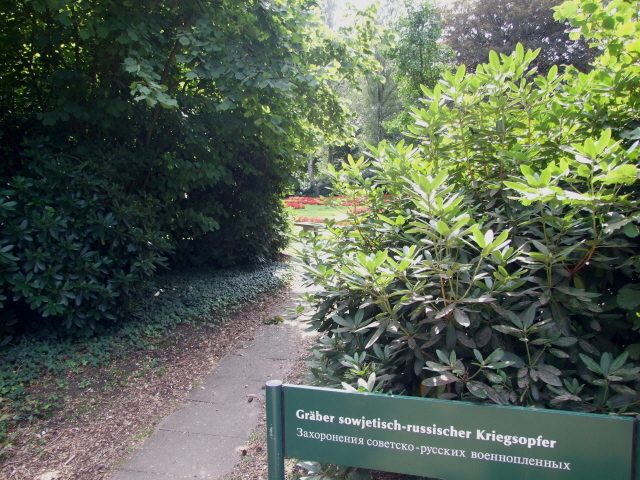 For even more nature, you can also head up north for the hiking paths along the course of the Alster river (cf. Fuhlsbüttel prison).